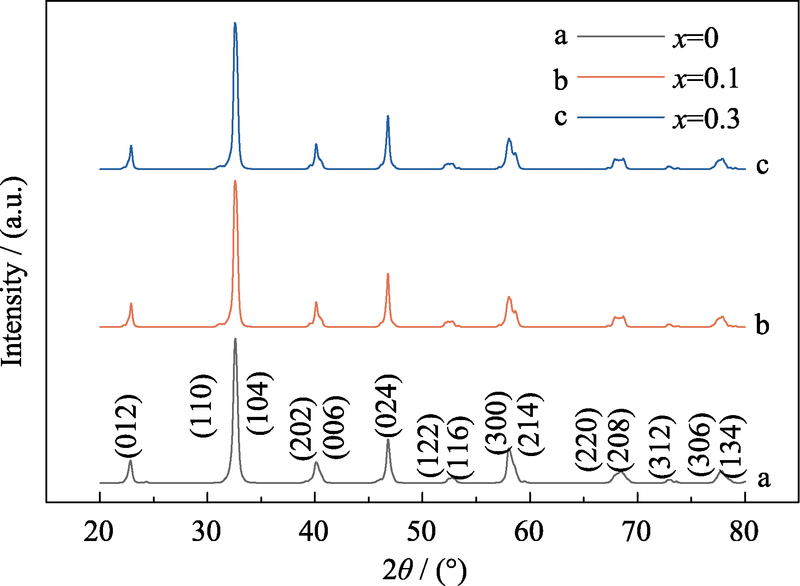 La0.8Sr0.2Mn1-xCoxO3 (x = 0, 0.1, 0.3) samples were prepared via the conventional high-temperature solid-state reaction method. 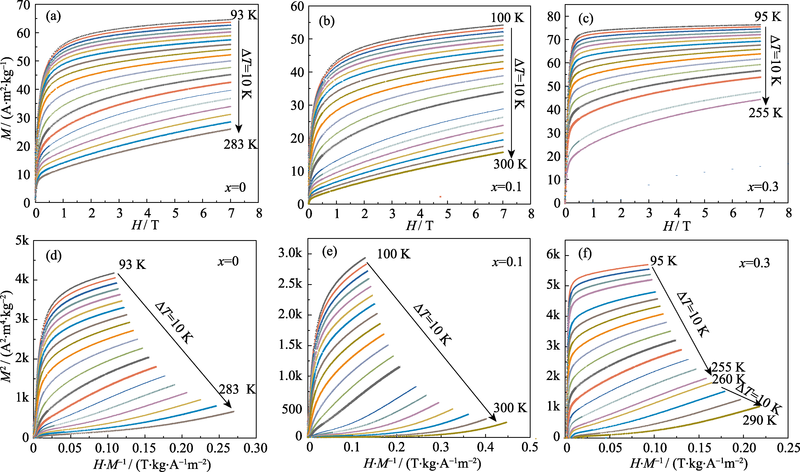 The effects of Co doping on Griffiths phase, magnetic entropy change, critical behavior, and electrical transport properties of La0.8Sr0.2MnO3 (LSMO) polycrystalline samples were systematically investigated. 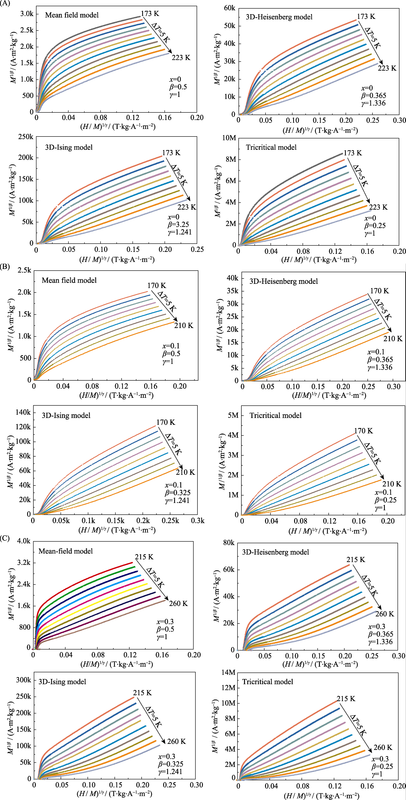 Results show that the prepared polycrystalline samples all have rhombohedral symmetry structures with Griffiths phase above the low temperature magnetic transition temperature (TC2). When magnetic field is applied to the La0.8Sr0.2Mn1-xCoxO3 (x = 0, 0.1, 0.3) samples, the maximum magnetic entropy change ΔSmax for 7 T is -2.88, -2.05, and -2.75 J/(kg·K), respectively. Doping of Co element makes ΔSmax decrease first and then increase. The critical behavior of the parent phase fits best with the mean field model, and that of the sample after doping fits best with the 3D Heisenberg model. The mother phase is a semiconductor material, and the metal insulator transition appears near the low temperature magnetic transition temperature (TC2) when the Co element doping amount reaches 0.1. 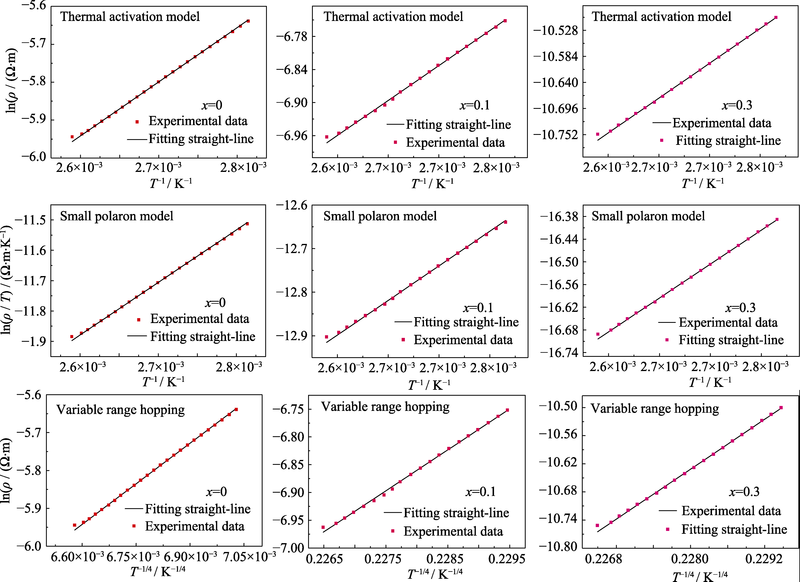 The conductivity of the three samples in high temperature region satisfies the small polaron model. 刘娇, 王文清, 吴鸿业, 田野, 曹凤泽, 赵建军. Co掺杂钙钛矿锰氧化物La0.8Sr0.2MnO3电磁特性研究[J]. 无机材料学报, 2018, 33(11): 1237-1247. Jiao LIU, Wen-Qing WANG, Hong-Ye WU, Ye TIAN, Feng-Ze CAO, Jian-Jun ZHAO. 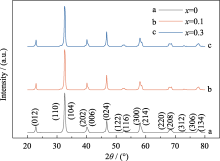 Electromagnetic Property of Co-doped La0.8Sr0.2MnO3 Perovskite Manganese Oxides[J]. Journal of Inorganic Materials, 2018, 33(11): 1237-1247. La0.8Sr0.2Mn1-xCoxO3(x=0, 0.1, 0.3)样品在0.01 T磁场下的M-T曲线(a)~(c)和χT-T曲线(d)~(f), 插图为对应的dMFC/dT-T曲线"
La0.8Sr0.2Mn1-xCoxO3(x=0, 0.1, 0.3)样品在0.01 T磁场下χ-1-T曲线, 插图为0.01 T下的lgχ-1-lgtm曲线, 其中tm=(T-TC)/TC"
La0.8Sr0.2MnO3(A)、La0.8Sr0.2Mn0.9Co0.1O3(B)和La0.8Sr0.2Mn0.7Co0.3O3(C)样品在居里温度以下自发磁化强度随温度的变化曲线MS-T(a)和MS (dMs/dT)-1-T(b)曲线 La0.8Sr0.2Mn0.7Co0.3O3样品在居里温度下零场磁化率倒数随温度的变化曲线χ0-1-T(c)和χ0-1 (dχ0-1/dT)-1-T曲线(d); 插图为相对应的Arrott-Plot"
La0.8Sr0.2Mn1-xCoxO3(x=0 (a), 0.1 (b), 0.3 (c))样品分别在108~278 K、100~300 K和110~285 K的等磁场下磁熵变随温度的变化曲线(-ΔS-T)"
La0.8Sr0.2Mn1-xCoxO3(x=0, 0.1, 0.3)样品在外加磁场为2 T时, 磁电阻随温度的变化曲线(MR-T)"
 CHABARA K, OHNO T, KASAI M, et al.Magnetoresistance in magnetic manganese oxide with intrinsic antiferromagnetic spin structure. Appl. Phys. Lett., 1993, 63(14): 1990-1992. JIN S, TIEFEL T H, MCCORMACK M, et al.Thousandfold change in resistivity in magnetoresistive La-Ca-Mn-O films.Science, 1994, 264(5157): 413-415. MICHALOPOULOU A, SYSKAKIS E, PAPASTAIKOUDIS C.Calorimetric and electrical transport properties of stoichiometric La1-xSrxMnO3 compounds.Journal of Physics: Condensed Matter, 2003, 15(45): 7763-7775. ZHAO B C, SONG W H, MA Y Q, et al.Magnetic and transport properties of Co-doped manganite La0.7Sr0.3Mn1-xCoxO3(0≤x≤ 0.5). Phys. Stat. Sol., 2005, 242(8): 1719-1727. WANG GUI-YING, LIU NING. Studies on the influence of B doping on the magneto-electro-mechanical properties of perovskite manganese oxides. Journal of Suzhou University, 2008, 23(5):43, 108-111. El-HAGARY M, SHOKER Y A, MOHAMMAD S, et al.Structural and magnetic properties of polycrystalline La0.77Sr0.23Mn1-xCuxO3 (0≤x≤0.5) manganites.Journal of Alloys and Compounds, 2009, 468(1/2): 47-53. MUKADAM M D, YUSUF S M. Magnetocaloric effect in the La0.67Ca0.33Mn0.9Fe0.1O3 perovskite over a broad temperature range. Journal of Applied Physics, 2009, 105(6): 063910-1-3. LI BAO-HE, XIANYU WEN-XU, ZHANG JIAN, et al.Magnetism and giant magnetoresistance effect of calcium manganese oxide La0.7Sr0.3FexMn1-xO3.Journal of the Chinese Rare Earth Society, 2001, 19(2): 174-177. 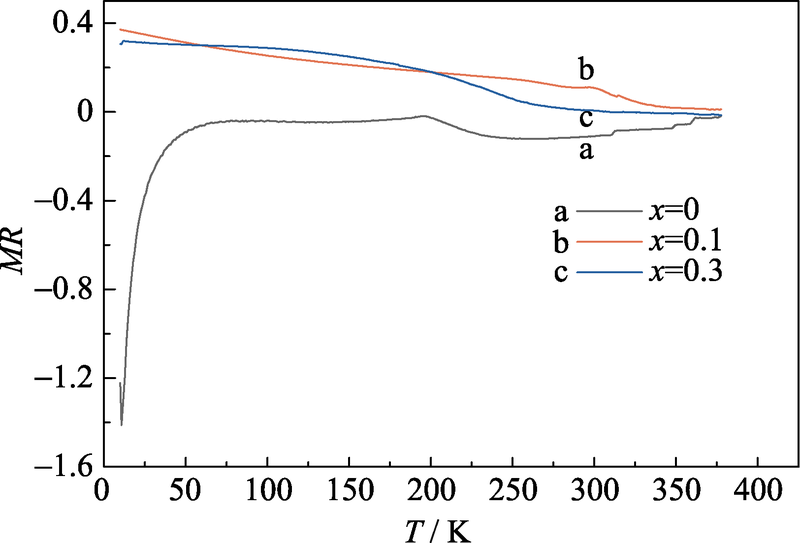 LI G, TANG P, SUN X, et al.Low temperature resistance minimum and its origin in La2/3Ca1/3Mn1-xCuxO3 (x = 0.15) system. Acta Phys. Sin., 1999, 48(3): 505-510. JIANG KUO, GONG SHENG-KAI.Effect of cobalt on the magnetoresistance characteristics of rare-earth doped manganites.Chinese Physics B, 2009, 18(7): 3035-3039. 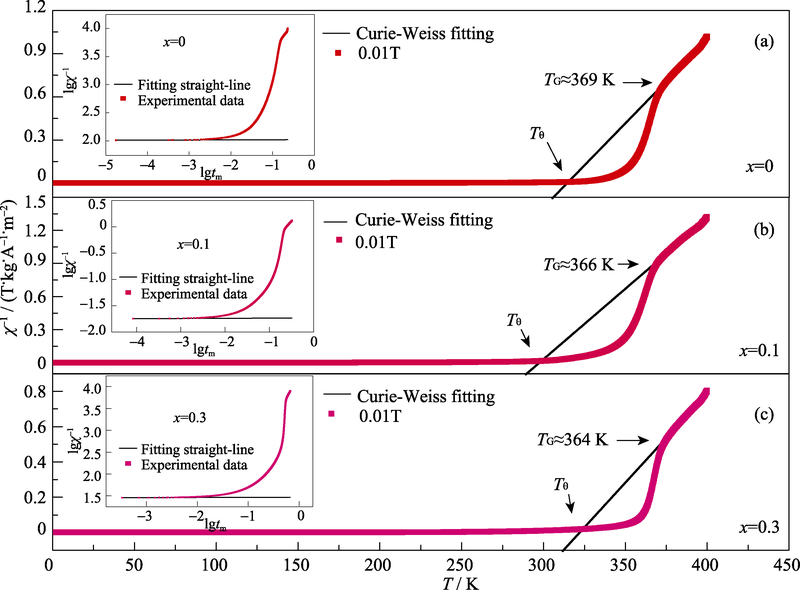 GRIFFITHS R B.Nonanalytic behavior above the critical point in a random ising ferromagnet.Phys. Rev. Lett., 1969, 23(1): 17-19. BRAY A J, MOORE M A.On the eigenvalue spectrum of the susceptibility matrix for random spin systems.J. Phys. C, 1982, 15(23): L765-L771. BRAY A J.Nature of the Griffiths phase.Phys. Rev. Lett., 1987, 59(5): 586-589. 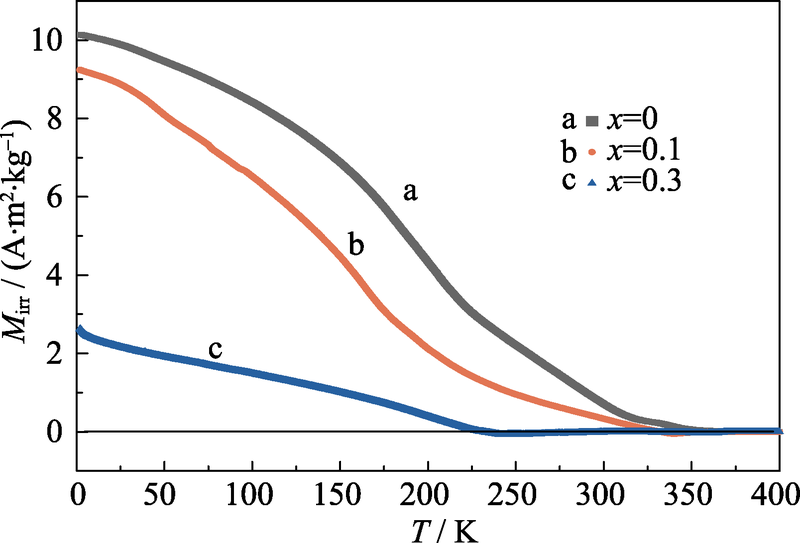 BRAY A J.Dynamics of dilute mangnets above TC.Phys. Rev. Lett., 1988, 60(8): 720-723. BRAY A J, HUIFANG D.Griffiths singularities in random magnets: results for a soluble model.Phys. Rev. B, 1989, 40(10): 6980-6986. ZHOU S M, LI Y, GUO Q, et al. Observation of a Griffiths-like phase in Ca-doped cobaltites. J. Appl. Phys., 2013, 114(16): 163903-1-6. 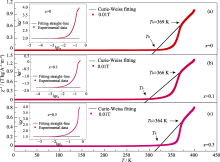 ADEELA N, KHAN U, NAZ S, et al.Low temperature nucleation of Griffiths phase in Co doped LaMnO3 nanostructures.Applied Surface Science, 2017, 422: 184-191. JIANG KUO.Effect of Co doping on magnetoresistance of ferromagnetic La0.8Sr0.2MnO3. Acta Phys. Sin., 2010, 59(4): 2801-2807. HO T A, LIN S H, KIM C M, et al.Magnetic and magnetocaloric properties of La0.6Ca0.4-xCexMnO3.Journal of Magnetism and Magnetic Materials, 2017, 438: 1-20. LU CHENG-LIANG, HU NI, YANG MING, et al. 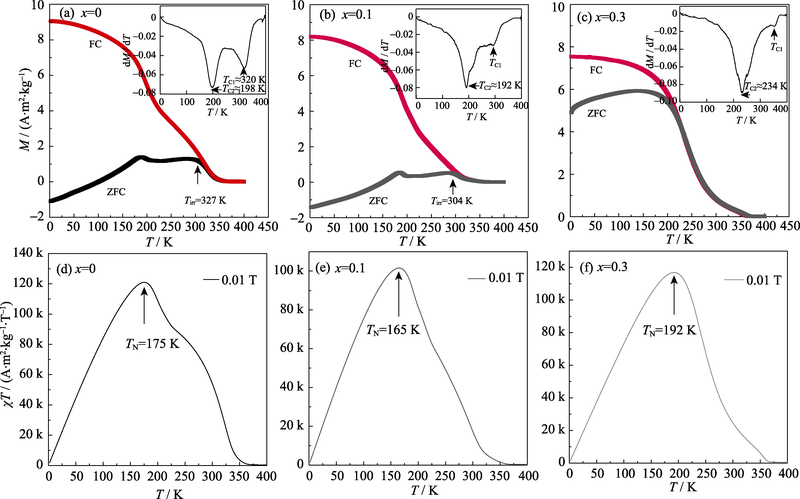 High magnetic field phase diagram in electron-doped manganites La0.4Ca0.6Mn1-yCryO3. Scientific Reports, 2014, 4: 4902-1-7. 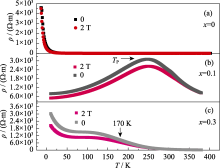 BHAGYA UTHAMAN, ANAND K S, RAJEH KUMAR RGJAN, et al.Structural properties, magnetic interactions, magnetocaloric effect and critical behaviour of cobalt doped La0.7Te0.3MnO3.RSC Advances, 2015, 5(105): 86144-86155. ZHAO B C, MA Y Q, SONG W H, et al.Magnetization steps in the phase separated manganite La0.275Pr0.35Ca0.375MnO3. Physics Letters A, 2006, 354(5/6): 472-476. DEISENHOFER J, BRAAK D,KRUG VON NIDDA H A, et al. Observation of a Griffiths phase in paramagnetic La1-xSrxMnO3. Phys. Rev. Lett., 2005,95(25): 257202-1-4. 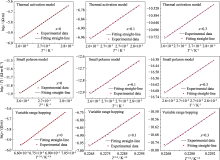 XING RU, ZHENG LING, ZHOU MIN, et al.The study of Griffiths- like phase Gd-doping manganites Pr0.5Sr0.5MnO3.The Journal of Low Temperature, 2016, 38(6): 51-54. ZHANG PENG-YUE, YANG HANG-FU, ZHANG SU-YIN, et al.Magnetic and magnetocaloric properties of perovskite La0.7Sr0.3Mn1-xCoxO3.Physica B, 2013, 410: 1-4. 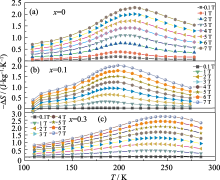 BANERJEE B K.On a generalised approach to first and second order magnetic transitions.Phys. Lett., 1964, 12(1): 16-17. 苏彦涛. 钙钛矿型稀土钛酸盐晶体磁热效应及临界行为的研究. 哈尔滨: 哈尔滨工业大学博士学位论文, 2013. THANH TRAN DANG, LINH DINH CHI, MANH T V, et al. 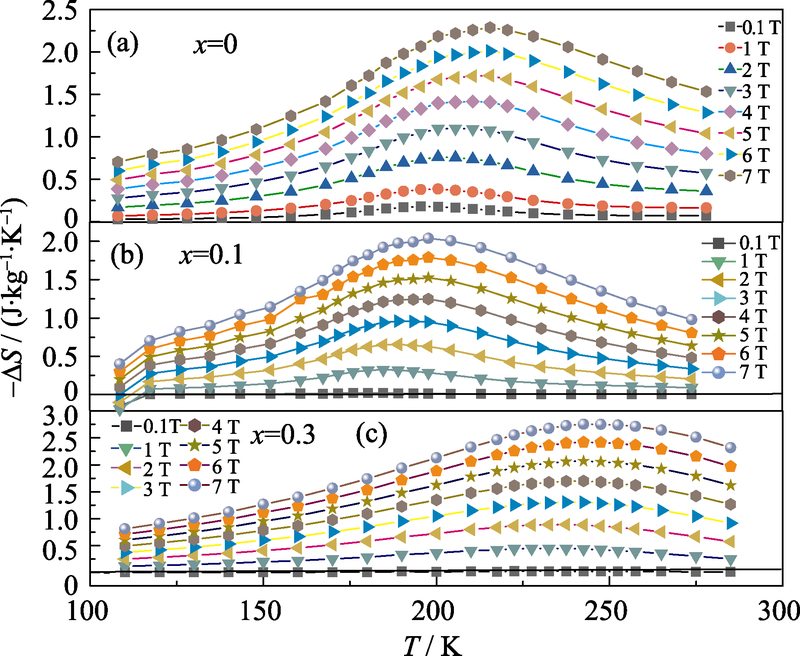 Coexistence of short- and long-range ferromagnetic order in La0.7Sr0.3MnxCo1-xO3 compounds. J. Appl. Phys., 2015, 117(17): 17C101-1-4. DORRA TURKI, ZAFAR KHAN GHOURI, SAEED AL-MEER, et al. Critical behavior of La0.7Ca0.3MnxCo1-xO3 perovskite (0.1<x<0.3).Magnetochemistry, 2017,3(3): 28-1-22. 鲁毅, 赵建军, 吴鸿业, 等. 磁性功能材料研究进展. 北京: 北京邮电大学出版社, 2013: 35-36. SUN XIAO-DONG, XU BAO, WU HONG-YE, et al. 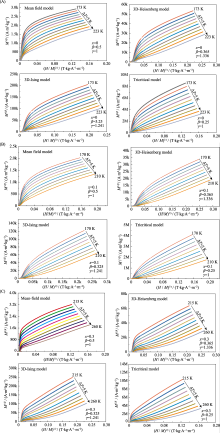 Magnetic entropy change and electric transport properties of Tb-doped double-layered manganese oxide La4/3Sr5/ 3Mn2O7. Acta Phys. Sin., 2017, 66(15): 157501-1-8. 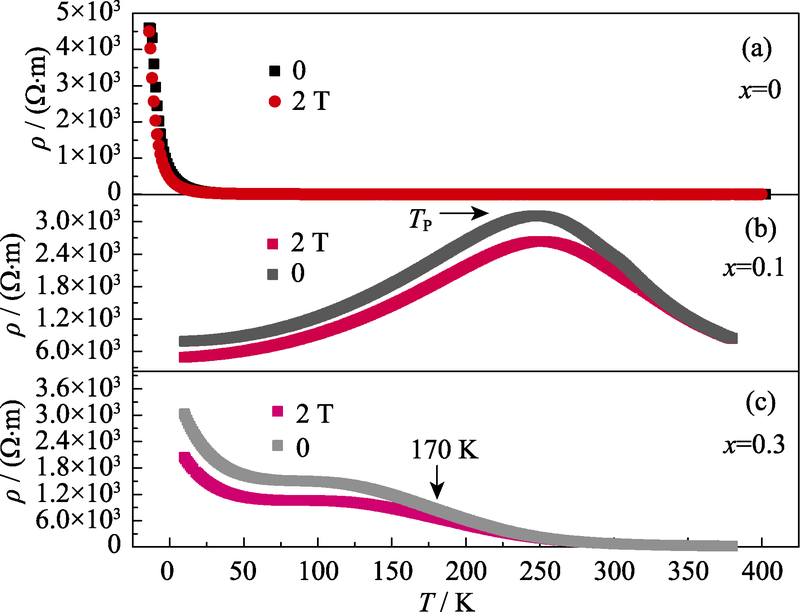 TROYANCHUK I O, EFIMOV D A, KHALYAVIN D D, et al.Magnetic ordering and magnetoresistive effect in La1-xSrx(Mn1-yMey)O3 perovskites(Me = Nb, Mg).Physics of the Solid State., 2000, 42(1): 81-85. ZHAO B C, SONG W H, MA Y Q, et al.Magnetic and transport properties of Co-doped manganite La0.7Sr0.3Mn1-xCoxO3 (0≤x≤0.5).Phys. Stat. Sol., 2005, 242(8): 1719-1727. 李周, 肖翀. 异层等价离子双掺杂策略优化BiCuSeO的热电性能[J]. 无机材料学报, 2019, 34(3): 294-300. 胡慧珊, 杨君友, 辛集武, 李思慧, 姜庆辉. SnO的歧化反应对SnTe热电性能的优化[J]. 无机材料学报, 2019, 34(3): 315-320. 黄志成, 姚瑶, 裴俊, 董金峰, 张波萍, 李敬锋, 尚鹏鹏. n型SnS热电材料的制备与性能研究[J]. 无机材料学报, 2019, 34(3): 321-327. 檀小芳, 端思晨, 王泓翔, 吴庆松, 李苗苗, 刘国强, 徐静涛, 谈小建, 邵和助, 蒋俊. 多掺杂协同调控碲化锡热导率和功率因子提升热电性能[J]. 无机材料学报, 2019, 34(3): 335-340. 刘虹霞, 李文, 张馨月, 李娟, 裴艳中. (Ag2Se)1-x(Bi2Se3)x的热电性能研究[J]. 无机材料学报, 2019, 34(3): 341-348. 韩林材, 丁士华, 宋天秀, 黄龙, 张晓云, 熊中. ZBAS对BaAl2Si2O8结构与微波介电性能的影响[J]. 无机材料学报, 2018, 33(8): 883-888. 屈婧婧, 魏星, 刘飞, 袁昌来, 陈国华, 黄先培. 热处理对Mg-Al-Si-Ti-B系微晶玻璃析晶及介电性能的影响[J]. 无机材料学报, 2018, 33(12): 1309-1315. 张聪, 康朝阳, 宗海涛, 李明, 梁珊珊, 曹国华. 应力对蓝宝石衬底上生长二氧化钒薄膜结构和光电性能的调控[J]. 无机材料学报, 2018, 33(11): 1225-1231. 楚增勇, 李高林, 蒋振华, 王春华. 高质量钙钛矿单晶CH3NH3PbI3研究进展[J]. 无机材料学报, 2018, 33(10): 1035-1045. 刘飞, 黄先培, 袁昌来, 陈国华. 烧结温度和CaTiO3添加对不稳定层状Can+1TinO3n+1 (n = 1)陶瓷体系结构与介电性能的影响[J]. 无机材料学报, 2017, 32(5): 489-494. 屈婧婧, 魏星, 宋小辉, 袁昌来, 刘飞. B位(Mg1/3Ta2/3)4+置换对新型Sr基(Sr, Nd, Ca)TiO3微波陶瓷结构及介电性能的影响[J]. 无机材料学报, 2017, 32(3): 293-298. 杨帅, 徐攀攀, 王明文, 郝文涛, 孙礼, 曹恩思, 张雍家. NaCu3Ti3Sb0.5Ta0.5O12陶瓷的高介电性质及相关机制的研究[J]. 无机材料学报, 2017, 32(10): 1029-1035. 徐红梅,严红革,陈振华. 低温燃烧合成法制备 Ce0.8Y0.2O1.9 纳米粉体[J]. 无机材料学报, 2006, 21(4): 809 -814 . 蔡之让 刘宁,童伟,徐素军,张裕恒. (La0.6Dy0.1)Sr0.3MnO3的磁热效应研究[J]. 无机材料学报, 2005, 20(3): 618 -622 . 周飞,龙纪文,孟中岩. 铌掺杂PMS-PZ-PT三元系压电陶瓷温度稳定性研究[J]. 无机材料学报, 2004, 19(3): 586 -592 . 姚爱华,王德平,黄文hai,吴卫和,章林. Gd3+掺杂对Mn-Zn铁氧体结构、磁性能和磁热效应的影响[J]. 无机材料学报, 2007, 22(2): 201 -204 . 张昕,廖晶莹,谢建军,沈炳孚,邵培发,李长泉,袁辉,殷之文. Si4+离子对Y3+:PbWO4晶体闪烁性能及辐照硬度的影响[J]. 无机材料学报, 2002, 17(5): 931 -937 . 刁雷,齐建全,桂治轮,李龙土. BT-PMN共烧陶瓷的新的介温特性[J]. 无机材料学报, 2001, 16(2): 381 -384 . 文衍宣,肖 卉,甘永乐,粟海锋,王 凡. 自蔓延高温合成锂离子电池正极材料LiCoO2[J]. 无机材料学报, 2008, 23(2): 286 -290 . 张小川,王德平,姚爱华,黄文hai. Mn0.8Zn0.2Fe2O4/MgAl-LDHs复合材料的磁性能和磁热效应[J]. 无机材料学报, 2008, 23(4): 677 -682 . 陶善文,彭定坤,孟广耀. 无机盐-氧化物复合电解质导电机制[J]. 无机材料学报, 1999, 14(2): 203 -210 . 李 亮,朱英杰,曹少文,马明燕. 碳酸钙纳米结构多孔空心微球的制备及其药物缓释性能研究[J]. 无机材料学报, 2009, 24(1): 166 -170 .